The Bridges – Dig Delve – An online magazine about gardens, landscape, growing & making. 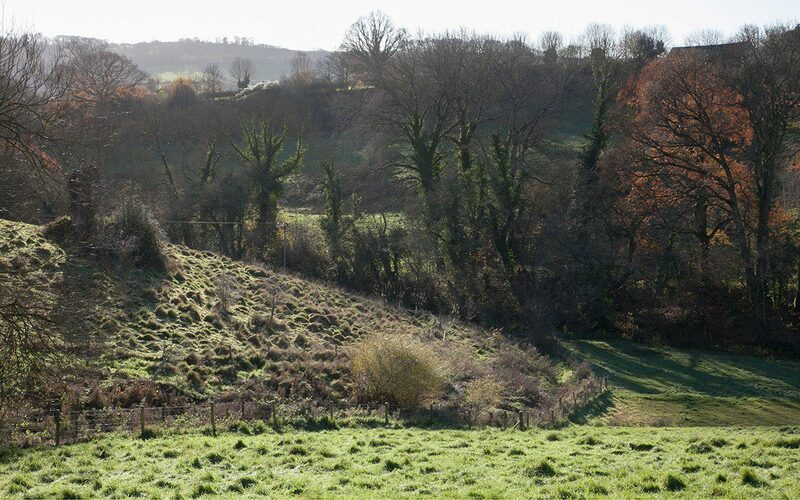 Although the garden has its carefully drawn boundary – the fence that keeps the sheep out and my garden domain within manageable bounds – I want the eye to move freely up onto the Tump and then down to follow the ditch below it. 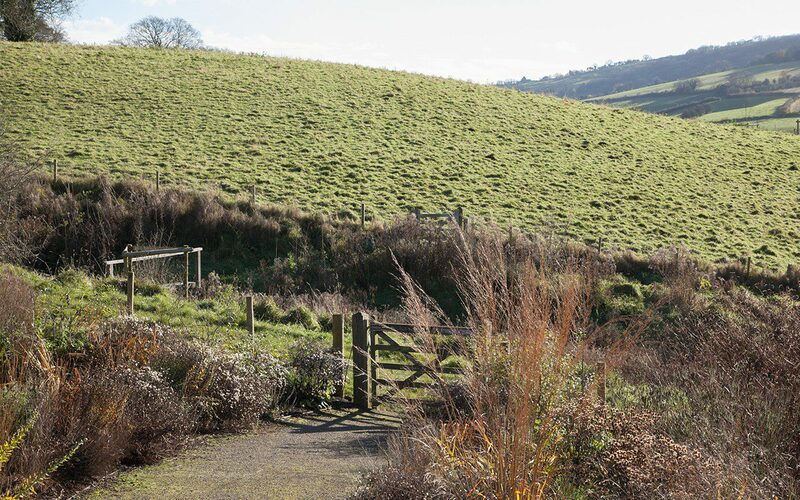 The gates where the paths terminate give access to the pasture beyond, but they also provide a visual draw to the garden’s edge, where you can lean and contemplate the prospect of the wilder places. 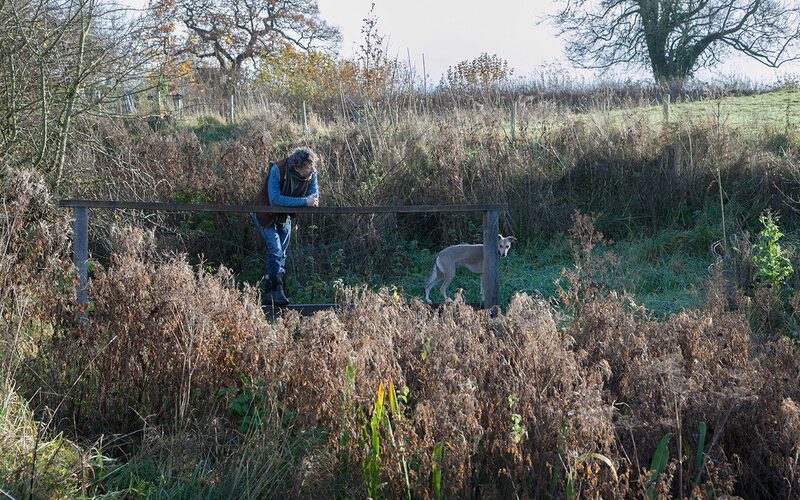 I had planned for an engagement with the ditch for some time before the garden went in, but until this summer this damp crease in the land was a place that required a pair of watertight boots and a sense of adventure. When we came here its steep, muddy banks were deep with ruts where the cows had made their way down to the water that all year runs freely and constantly from the springs above us. The sedge was the indicator that the ditch had a wetland flora and, since it was fenced to protect it from grazing, this has evolved and diversified. We have the best of the primroses here in the spring, large self-sown communities that are happy on the cool slopes and remarkable for their ability to survive beneath the total eclipse of summer growth, which starts soon after they have peaked. 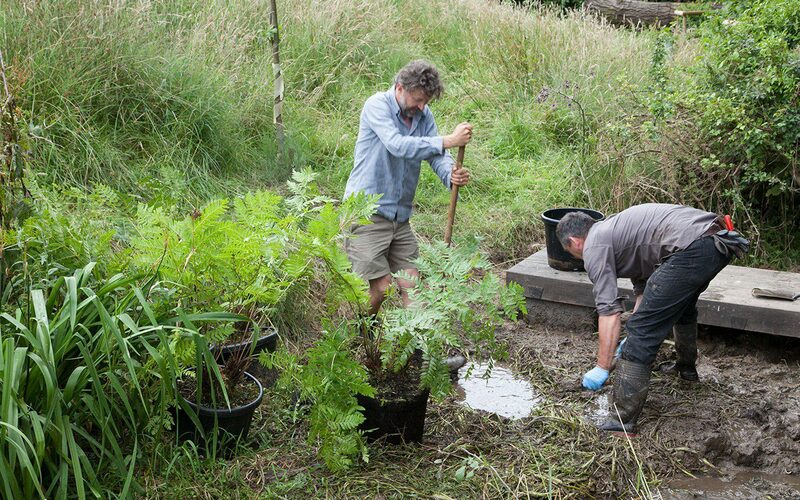 First come ragged robin and campion, followed by the brutish and deadly hemlock water dropwort (which we are controlling by cutting as the flower spikes rise) and then meadowsweet, great willowherb and wild angelica. As we have been getting on top of the brambles, which have been kept in check with strimming in February, I have been carefully adding to the ditch banks to provide another layer of interest; snowdrops for winter, marsh marigolds and our Tenby daffodil to kick-start the spring and, in summer, the upper reaches are now populated by a community of Inula magnifica. Salix purpurea ‘Nancy Saunders’ (which I also have on the garden boundary to help the eye jump the fence) runs in stops and starts along its length and, in the shade of the crack willow, we have the surprise of Gunnera manicata. I had always imagined switching back and forth from bank to bank to enjoy this environment and, once the shaping of the garden was complete, the next logical step was to make it more accessible. Over several seasons I identified four positions for crossings that would each provide a different experience. A link from the garden directly up onto the Tump draws a line through the Cornus mas I’ve grouped below where we keep the bees. The cut in the land is steepest here, with the water falling unseen beneath growth in the summer, but the rocky streambed provides a good acoustic that makes you aware of the source. The rivulet reveals itself again in the winter to sparkle in sunshine. The prospect is good here so we made a sleeper crossing (main image) with a handrail to lean on that is suspended well above the water. I have planned for a bench to go on the far bank next summer, so that from there you can look back over the garden before moving on. 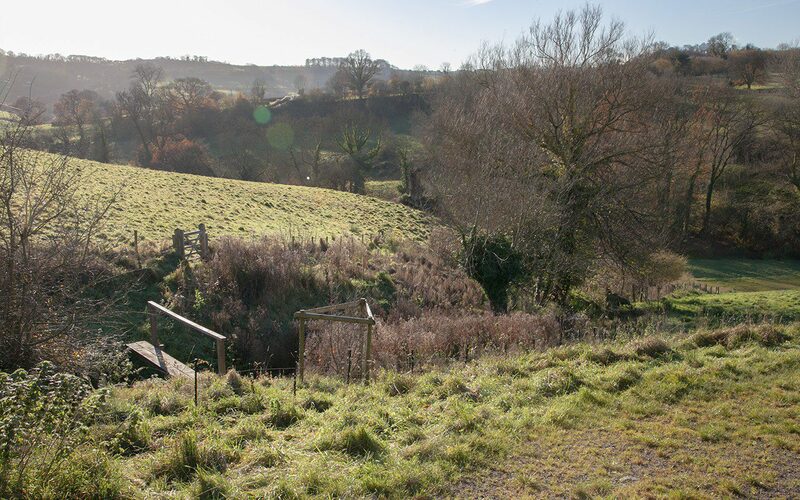 Once through the far gate you can walk up onto the meadow of the Tump or downhill to a lower gate behind the crack willow which allows you onto the slope above the ditch again. 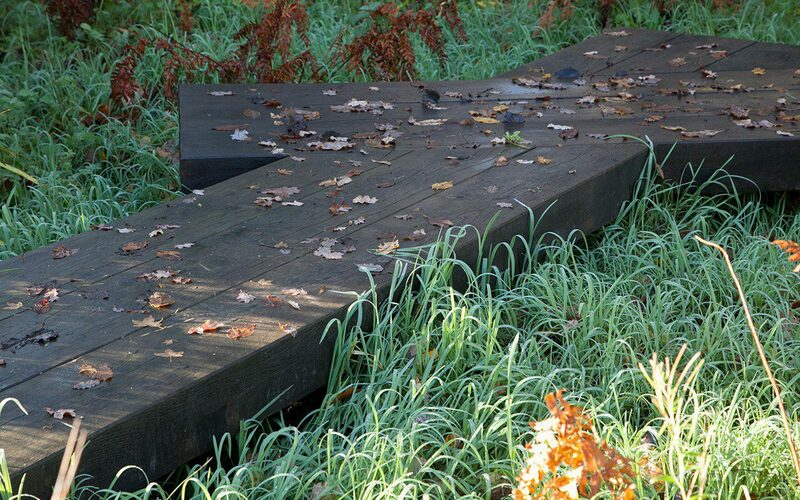 The path pushes into the shade where in time, as the gunnera grow and meet overhead, you will be able to duck under their canopy and cross the water on a simple stone sleeper bridge where the banks splay and slacken out under the tree. 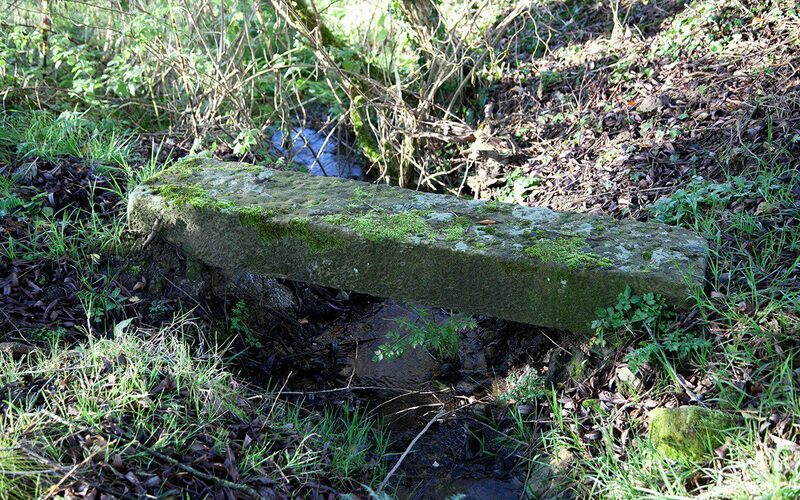 Before the land eases where the fields flatten in the stream basin there is a stile and another slab crossing to take you back across where the primroses grow most strongly. From here you push into a track cut in the wet meadow of angelica and meadowsweet and then on and down to the ankle of the slopes where the ditch forms a marshy delta before dropping into the stream. Here between the fields the farmer before us had made a ford of sorts for easy droving so, when we first got here, we made a makeshift crossing with logs and stones that required a number of leaps to traverse it. 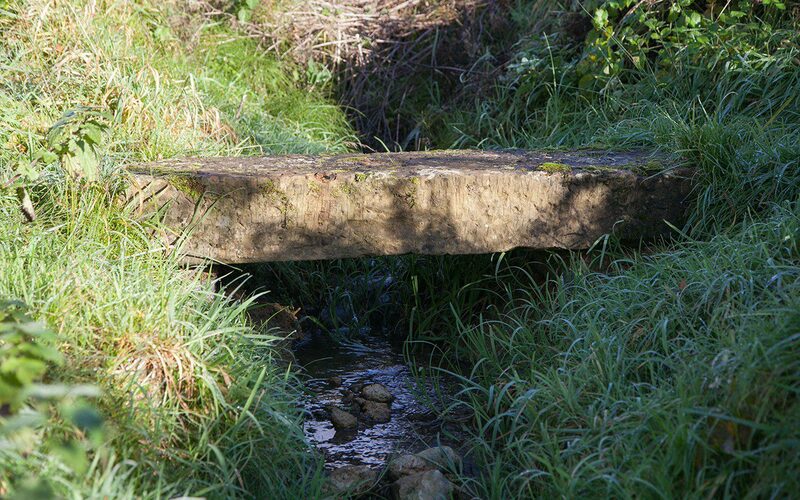 I had always envisioned a bridge here that changed direction, to echo the journey back and forth across the ditch. In Japan these bridges are kinked to confound devils that can only move in a straight line, but here the change in direction would slow your passage and make you pause. 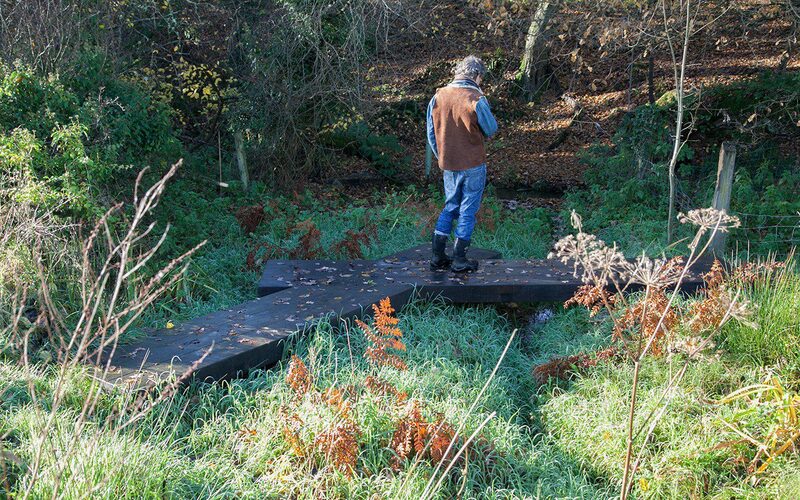 As luck would have it, one of the bridges we made for the 2015 Chelsea Flower Show was not required when the garden was relocated to Chatsworth, and Mark Fane of Crocus kindly gifted it to me. So in August of this year long-term collaborator Dan Flynn of Gardenlink came down to install it. 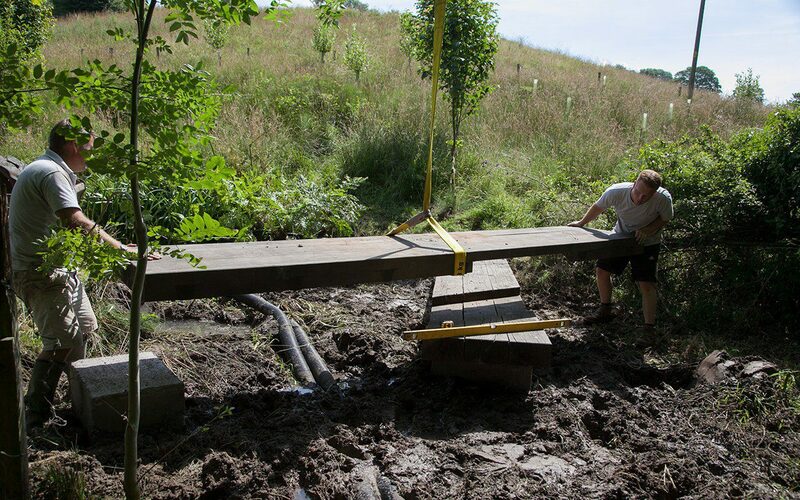 The ditch delta was temporarily drained in order to make the pilings that support the bridge, and the carefully planned installation went more smoothly than expected. It immediately looked like it was meant to be there. 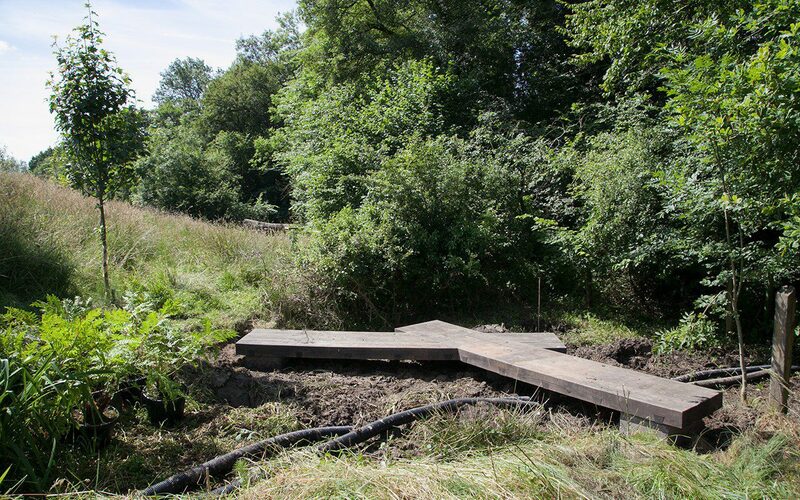 The zig-zag bridge has been the making of a place that was previously damp and difficult to traverse. It has turned a swampy stumble between one field and the next into somewhere you now want to head for. I like it for being the only intervention you are aware of here and for the fact that it lifts you above the ground to give new perspective. I have worked Osmunda regalis ‘Purpurascens’ and Iris x robusta ‘Dark Aura’ into the wet ground to either side. And I have planned for another gate from the field side, which will catch the eye from the garden above and serve as a focus to draw you down to the end of this journey or, if you are tempted to continue into the coppice beyond, the beginning of the next.